Victorian fashion comprises the various fashions and trends in British culture that emerged and grew in province throughout the Victorian era and the reign of Queen Victoria, a period which would last from June 1837 to January 1901. 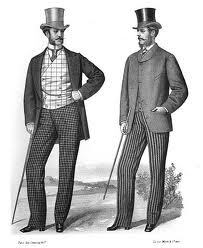 In the Victorian era, daily dress was much more formal than it is today. Unless they were a workman or laborer, every gentleman was expected to wear a coat, vest, and hat. During the 1840s, men wore tight-fitting, calf length frock coats and a waistcoat or vest.Men wore trousers that had stripes and sometimes checks which they often paired with different patterns, stripes or checks.Belts weren’t used, nor did pants even have belt loops. Rather, suspenders or braces of leather or canvas were common. Beyond a man’s clothing, the most basic accessory for every Victorian gentleman was the cravat.Also nearly universal was the pocket watch and fob, which were prominently displayed hanging from the front vest pockets.Most men also carried walking sticks of various styles and often wore gloves when out for dress occasions. Some etiquette books indicate that it was considered unseemly to allow a man’s skin to touch a woman, making gloves a necessity. The proper Victorian gentleman was not seen outdoors without a hat. The top hat was required for formal day and evening wear. Throughout much of the Victorian Era most men wore fairly short hair. This was often accompanied by various forms of facial hair including moustaches, side-burns, and full beards. A clean-shaven face did not come back into fashion until the end of the 1880s and early 1890s. By the 1850s the number of petticoats was reduced and the crinoline was worn.In the 1890s, women’s fashion became simpler and less extravagant; both bustles and crinoline fell out of use and dresses were not as tight as before. Corsets were still used but became slightly longer, giving women a slight S-curve silhouette. A petticoat or underskirt is an article of clothing for women; specifically an undergarment to be worn under a skirt or a dress. Crinoline was originally a stiff fabric with a weft of horse-hair and a warp of cotton or linen thread. The fabric first appeared around 1830, but by 1850, the word had come to mean a stiffened petticoat or rigid skirt-shaped structure of steel designed to support the skirts of a woman’s dress into the required shape. In form and function it is very similar to the earlier farthingale. The name crinoline was invented by one of the fabric’s manufacturers, who combined the Latin words crinis (meaning “hair”) and lin (meaning “flax”). An alternative origin for the word is sometimes given: the combination of the French words crin (specifically meaning “horse-hair”) and lin (again, meaning “flax”). The crinoline was the subject of much ridicule and satire. Dress reformers did not like it either — they seized upon the cage aspect of the crinoline and claimed that it effectively imprisoned women. Given that the crinoline did eventually have a maximum diameter of up to 180 centimetres (six feet) it is easy to imagine difficulties in getting through doors, in and out of carriages, and the general problems of moving in such a large structure. However, while the crinoline needed to have a degree of rigidity, it also had a degree of flexibility.